What our goats are doing at the shows. Many other wins at other fairs from our blood lines. 1999 National Western Stock Show Fourth and Fifth. 1998 Elbert County Fair -- Grand Champion and Reserve Champion marker wethers. 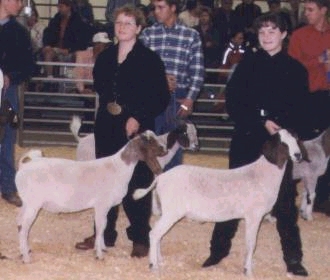 1998 El Paso County Fair -- Reserve Champion marker wether. 1997 Weld County Fair -- Grand Champion market wether, out of thirty entries . A Bo 606 grandson.